October 2012 - During the second week of October, I was honored to be invited to participate in the Sydney International Wine Competition in Australia with 12 other wine judges from around the world. Two of us arrived on the non-stop flight from San Francisco to Sydney on Sunday morning at 7:30am and took a taxi ($15 with tip) to the Mercure Airport Hotel where they had reserved a day room so we could shower before meeting the rest of our group at 10am. We then boarded a small bus and drove the 1.5 hours into the Blue Mountains and Lillianfels Resort. The Blue Mountains of Australia are a World Heritage Site and renown for their beauty. They remind me of a smaller version of the Grand Canyon with trees. I was told they are called “blue” because the eucalyptus trees that cover the steep mountains release a blue resin in the air that causes the mountains to look blue – especially in the evening before sunset. It is a breathtakingly beautiful area with multiple hiking trails, and huge cliffs and rock formations. Colorful parrots fly through the trees including red and blue rosettas, pink and grey gulahs, and large, loud white and yellow cockatoos. They even have the rare Lyre Bird, which has a large fan-shaped tail that looks like a lyre, and is related to the peacock. One of the most famous areas of the Blue Mountains is the Three Sisters overlook. These are three large rock formations that rise up from the canyon floor and are beautiful to behold. Thousands of tourists visit every year, and it turned out that our hotel, Lillianfels Resort, was located only a five minute walk from the Three Sisters Look-out. Lillianfels is a famous old resort on the edge of the canyon near the Three Sisters. It looks and feels like an old country manor with large comfortable lobby and rooms decorated in Victorian fashion with fabric wallpaper and large draperies above each bed (in most rooms). It is quite expensive with prices ranging from $250 to $600 a night. The beds are some of the most comfortable I have ever slept in, and the breakfast – which is included in the price – is a decent size buffet in a sunny dining room. There is an indoor and outdoor pool, spa, tennis courts, billiard room, and a Devonshire tea served every afternoon in the lobby. My experience here was mixed in that I enjoyed the amenities but had problems with my room, and a very poor response from the staff that didn’t match their claim to be a 5-star hotel. The first night I arrived there was no hot water in my room. When I called to complain they told me it would be off for 1 to 2 hours. So after a 14-hour flight and a long day, I fell asleep without being able to take a hot bath. The next morning, when I took a shower, the drain didn’t work and it flooded the bathroom. I called to report it, and they said it would be fixed, but it wasn’t until the second day – after the bathroom had flooded two more times – that they finally suggested I change rooms. I was happy about this, because the lock on the door didn’t work that well, and when I arrived back to my room the second day, the door to my room was open! Apparently the maid had done this because I remember distinctly how I had to slam it very hard in order for the lock to catch. The new room was much nicer because it didn’t have a view of the large green dumpsters near the tennis course. Instead it had a view of the parking lot and trees. One disappointment about this hotel is that only a few of the very expensive rooms on the upper floors have a view of the beautiful canyon. Once in the new room, I continued to have small problems that I wouldn’t expect with a regular 5-star hotel, such as the bedside phone not working and the bathtub plug missing. I was able to use the desk phone and finally get these small issues resolved, however the service and maintenance here is not what would be expected of their rating and claim to be a Starwood Luxury Resort. Fortunately the small issues at the hotel were eclipsed by the excellent time I had at the wine judging. The director, Warren Mason, hosted the judging at his charming house called “Birdland,” because it has a large beautiful garden filled with colorful Australian birds. The first two days, we evaluated 2000 wines (approximately 150 wines per day per judge, spitting), and on breaks we would congregate in the gardens or play boule, ping-pong, or darts. Once we narrowed down the wines to the top 400, we spent the next 2.5 days evaluating these wines again with food. 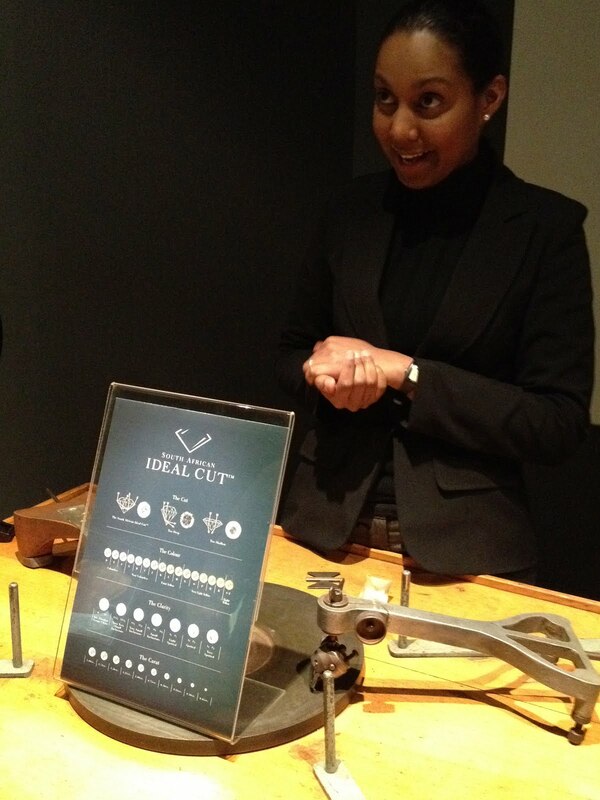 It was a fascinating judging process that I haven’t experienced before. Our scores for these will determine the 100 top wines for the competition. See: www.100topwines.com for more information. In the mornings and evenings, we would take hikes along the Blue Mountains trails, and one morning I even ventured down the famous 1000 stairs and took the loop walk. There is a caution sign stating it is only for strong walkers. It took me 2 hours, and was beautiful as we passed the Katoomba waterfall and saw a Lyrebird on the path. For the next two days however, my legs were very sore. In the evenings, we generally met in the lobby for a cocktail around 7pm and then sat down to a wonderful dinner at 8. I felt like I was staying at an English manor for a week as a houseguest with a group of fascinating people, and found I really enjoyed the camaraderie and getting to know the other judges better each day. Every night they shared special bottles of wine from around the world, and one night we enjoyed a 1992 Grange Hermitage – bellisimmo! There were three special meals during my wine-judging week in the Blue Mountains of Australia. The first was the Welcome Lunch held at Birdland, where Warren Mason and his wife, Jacqueline, welcomed everyone with warm hospitality. We started with sparkling vouvray and oysters, then moved on to salmon in papette, followed by beef tenderloin, and finished with a cream brulee. For each course, Warren served two wines – one from the old world and one from the new. Then he gleefully quizzed us on the varietals and region. I have to admit it was a little tough after flying for 14 hours and feeling quite jet-lagged, but Wilfred Wong and I managed to get most of the varietals correct. It turns out that the common theme was wine from the Loire, the birthplace of Jacqueline. Furthermore, she was the talented chef who cooked the magnificent meal. The second memorable meal was a real Australian BBQ at the house of the stewards (those who set up the wine judging) where we had shrimp, kangaroo burgers, and beef tenderloin. We enjoyed this feast with several bottles of Champagne and many excellent Australian and New Zealand wines, as well as six wines from Thailand that were fun to taste. We were also serenaded by two strapping guitar players who sang slightly X-rated Australian bar ditties. The third meal was the Farewell Dinner that Warren held at Darling’s Restaurant. This is a splendid establishment with exceptional service. The architecture is old Australian with the mansion dating from 1886. The menu, which follows, was mouthwatering, and Warren was an excellent master of ceremonies as he called upon the judges to stand up and guess the wines (all Australian) for the various courses. • 4th Plate – White Peach Fool, Almond Macaroon Crumble, Peach and Moscato Granita, White Peach Sorbet with 3 dessert wines: De Bortoli Botrytis Semillon 2008, Josef Chromy Tasmania Botrytis Riesling 2007, and LillyPilly Sauvignon Blanc/Semillon 2011. It was hard to leave Australia after such a wonderful week. I should mention that the weather was excellent – sunny blue skies and in the 80’s most everyday. When we finished tasting the last 90 wines on Friday morning at 11am, we toasted with Pommery Champagne, and then headed to the airport. We caught the 3:45 non-stop home to San Francisco, and I was able to gaze out the window at the spectacular view of Sydney with the sun glinting off its downtown buildings and the ocean wrapping itself around the land in bays and inlets. In my opinion Sydney is one of the most beautiful cities in the world, along with San Francisco, Paris, and Capetown. Sept. 2012 - Several times throughout my wine trip to South Africa I asked winemakers the average wage they paid their vineyard workers. The answer was it depends on the region, as well as whether or not the workers have housing and benefits on the property. In terms of regional pay differences, it appears that Stellenbosch pays the highest wages at 170 Rand ($21) per day for a basic vineyard worker who does not live on the estate. Wineries in Cape Point and the Constantia region said they paid 120 – 150R per day ($15 - $18). In Swartland I was told they pay 100 to 120R ($12 - $15) per day, but also provide food in the form of a large BBQ. For wineries who provide worker housing and other benefits, the rates also vary by region. In Stellenbosch, we were informed that the monthly rages for a basic vineyard worker are 3000 R per month, or 143 R ($18) per day with housing. However, I had another person tell me that basic farm workers in the outlying areas often receive only 60 R ($8) per day with housing. More experienced workers receive higher wages. For example, one winery told us that a vineyard supervisor living on the estate makes around 8000 R per month ($1000 per month, or $47 per day assuming 21 work days per month). Considering the official unemployment rate in South Africa is currently 20%, and the unofficial rate is 30%, it is interesting to learn of these wages. They are higher than China, which is only around $8 to $10 per day in the Xinjiang wine region, but much lower than Napa Valley which pays an average of $12 per hour ($96 per day) for vineyard workers and around $16 per hour ($128 per day) for supervisors. After seeing the townships that surround Capetown with tiny shacks made of corrugated metal and wood fires built in old oil containers in the front yard for cooking, the houses of the vineyard workers appear plusher. They are usually larger and built of brick, clay or wood with green grass instead of dirt and pavement as seen in the townships. I asked the spouse of one winery owner what was different in the vineyards since Apartheid had ended. She said not much had changed, and that most of the workers had remained to work the farm. The main difference, she noted, was that they were becoming more independent. In the past she had to drive them to doctor, the store and other places, but now they were doing it themselves. It is interesting to see where South Africa is since Apartheid ended in 1994. The whole world is cheering for them as they emerge from a time when inter-racial marriages were forbidden, black leaders such as Nelson Mandela were jailed on Robbins Island, and more than 3000 people were forcibly removed from their homes in District 6 of Capetown because of the color of their skin. They watched their houses bulldozed, and were relocated many miles away. It’s hard to believe that these types of actions – which seem so reminiscent of Hitler – actually occurred between 1960 and 1993. Now the new black government is building houses in District 6 and trying to encourage the original owners to return, but there are many who find it too painful to do so. Yet despite the poverty witnessed in the townships and the high unemployment rate, there is still much to be hopeful for in South Africa. It is an incredibly beautiful country that takes your breath away at times, with views of vistas that often left the word “Eden” whispering through my mind. There are huge rugged mountains that are reminiscent of the granite cliffs of Yosemite. These meet in multiple verdant green valleys where charming towns and cities are built. Then there is the breath-taking coastline with steep twisting roads above the ocean reminding me of Big Sur, and white sandy beaches similar to Hawaii. Further inland lays the desert where the Big 5 roam: elephant, leopard, rhino, lion, and Cape buffalo. And everywhere there is a plethora of birds, flowers, and beautiful protea—the national flower of South Africa – that is part of the fynbos family, native vegetation that only occurs here in the world. Even more, the people are very friendly, and there seems to be a positive optimism despite the unemployment and the poverty. Tourists are welcomed warmly and there are many affordable tours available. In addition to city tours, safaris and sea dives with sharks, the best way to tap into the soul of South Africa is to listen to live music. We attended an African music night in one of the townships where the singing was so moving that in one moment, people had tears streaming down their faces, and the next they were dancing and shouting in the aisle. After this eight-day visit, I can see why experts believe that South Africa should be added to the BRIC countries (Brazil, Russia, India, China) as a new up and coming economic power. They are now adding an “S” to create BRICS with South Africa as the fifth country. It appears to have a huge potential for economic and cultural success in the future. And the South African wineries, which have been here for more than 300 years, can play a part in that economic engine – especially since wine quality has improved so much over the past several years. Furthermore, with the global recession waning, and global wine supplies dwindling, it seems like a great opportunity for South African wines to develop a unified promotion to expand sales, not only in their own country and continent, but in the USA, China, Japan, and other countries outside of Europe. Sept. 29 – 30, 2012 - After our tour of Meerlust, we returned to Capetown where almost everyone in our group caught night flights home. As a flight was not available for me, I checked back into the Cullinan Hotel and then walked downtown to go on the 30-minute free diamond tour at Jewel Africa. This was informative, and they explain to you how diamonds are mined, cut, where the term “carat” comes from, and provide an overview of the world’s most famous diamonds. On the walk back, I bought more souvenirs at a small street market (much better prices than in the stores), then stopped at a Thai restaurant and ordered take-out soup and a glass of chenin blanc. I had this in my room while the rain poured down outside the window, and watched old movies until I feel asleep. The next morning, I slept in, had breakfast at the buffet for the last time, and then packed. Of course on my last day, the sun came out and there was a beautiful blue sky with a temperature in the high 70’s. I left all of my luggage with the concierge and then took the 2 hour Red Bus Tour of Capetown. This is a great experience for around $18, and I wish I had done it the first day. They provide an excellent overview of the major town sites and history, including a tour through District 6, past the building where Nelson Mandela gave his famous speech, and to all of the Clifton beaches. Plus you can hop on and off any time. At 1:15pm I returned to the hotel to take my pre-arranged taxi to the airport that the concierge had booked for me. Here I was ripped off slightly by the taxi driver. The MW tour leader told me to plan on spending 200 - 250 Rand to take a taxi to the airport; the hotel said 300 Rand, but the driver tried to charge me 350. When I told him all I had was 320 – which was true – he said that was fine. Doesn’t leave a good taste in your mouth when the local taxis try to rip you off as you leave the country. Regardless, my flight was on time, and I eventually made it back home to San Francisco via London after more than 30 hours travel time. Sept. 29, 2012 - After breakfast, we spent an hour shopping in downtown Stellenbosch. This is a charming town with historic buildings, tree-lined streets, and fun shops. It is a great place for tourists, and is also home to the famous Stellenbosch University. Next we drove to Meerlust Wine Estates near the town of Stellenbosch. Here over fifty palm trees line the driveway as you entered the gates and approach the historic Cape Dutch Architecture of the winery (see photo). Even the rain that spattered our windshield could not dampen our spirits as we passed the vineyards and a large pond on the right with over fifty different birds and a magnificent black and white South African Fish Eagle posed on a tree branch. Chris Williams, Meerlust winemaker and MW candidate, welcomed us as we alighted from our vans and ushered us into the barrel room where a long table with white tables clothes and wine glasses was set for twenty people (see photo). As we settled into our seats, Chris provided a quick overview of the history of Meerlust, which is one of the oldest and most historic wineries in South Africa, established in 1692. The name “Meerlust” means “Pleasure of the Sea,” which is an apt name because it is located 3.5 kilometers from False Bay, which is part of the Atlantic Ocean. Meerlust comprises 400 hectares, of which 110 are planted to vineyards. It bottles, on average, 50,000 cases of 100% estate wines annually. Grape varieties include cabernet sauvignon, merlot, and cab franc on the warmer valley floor, and chardonnay and pinot noir in the cooler climate and higher elevation (1000 meters) of the hills. These higher points are also accosted by the “Cape Doctor” - the southeast wind that sweeps across this part of Africa – effectively cooling these vineyards further. Chris informed us that in 1756 the estate was purchased by the family of the current owner, Hannes Myburgh. Hannes is the 8th generation to manage the estate, and is apparently a shy reclusive person whom we did not meet, but apparently cooked our complete lunch and brought it into the barrel room, hidden behind a base cap, and then departed. When Chris told us this, it just made me want to meet Hans even more! Through most of its history, Meerlust was known for producing sweet white wines, which were popular at the time, and also used as a medicine for sailors to combat scurvy. However, in the 1960’s, on his Gap year (a year which many Europeans, South Africans, Australians, and New Zealanders have between high school and university in which they travel the world), Hans went to Bordeaux and Burgundy and fell in love with their wines. He returned to the estate and tried to convince his father to switch to dry reds, but when he refused, Hans purchased the farm and replanted the vineyards. Of these my favorite was the 2005 Meerlust Rubicon, which was amazingly fresh for its age with ripe red berries, herbs, and cassis. This followed through on the palate with spice, pepper, big tannins, high acid, and a very long finish. Chris said it was 70% cabernet sauvignon, 20% merlot, and 10% cabernet franc with two years aging on 70% new French oak and 2 years in bottle. In general Rubicon is designed to be aged 7 to 8 years before opening. Interestingly the 2007 was not nearly as fresh, and instead had a stewed earthy note with big chalky tannins, which Chris explained was due to a cooler vintage, whereas 2005 was quite warm. After the tasting huge platters of sliced beef with white mustard sauce appeared on a banquet table, along with loaves of freshly baked bread, butter, vegetables and rice. For dessert we had Slow Cooked Poached Pears and Cambrinie – a local cheese that is a combination of brie and camembert. We enjoyed this feast with the Rubicon and other wines from the tasting. Fortunately by the time we finished lunch the rain had abated and we were able to walk a short way from the cellar to a near-by cabernet sauvignon vineyard. Chris said it was planted in 1994, and the vines showed their age with thick shaggy trunks and spur-pruned cordons spread bi-laterally along a VSP trellis system. The spacing was 1 meter by 2.5 meters and the soil an alluvial deposit called Dundee soil. Chris said it was quite fertile and produced vigor in the vines, which required much thinning of shoots, leaves and clusters to control. The vines are irrigated as they only receive 500 – 600 ml of rain each year. 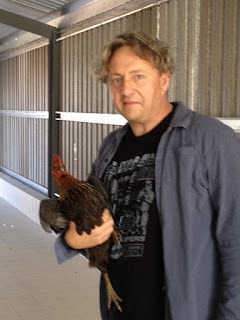 The farming method is luttee raisonee, though Chris said he is pushing toward all organic practices. Indeed the vineyard had a healthy cover crop of wheat that they will disk in soon, with further plans to use organic fertilizer. Though not Fair Trade certified, Chris reported that Meerlust has adopted many of the practices, which include providing support for schooling, health insurance, housing, and other social services for the workers on the estate. 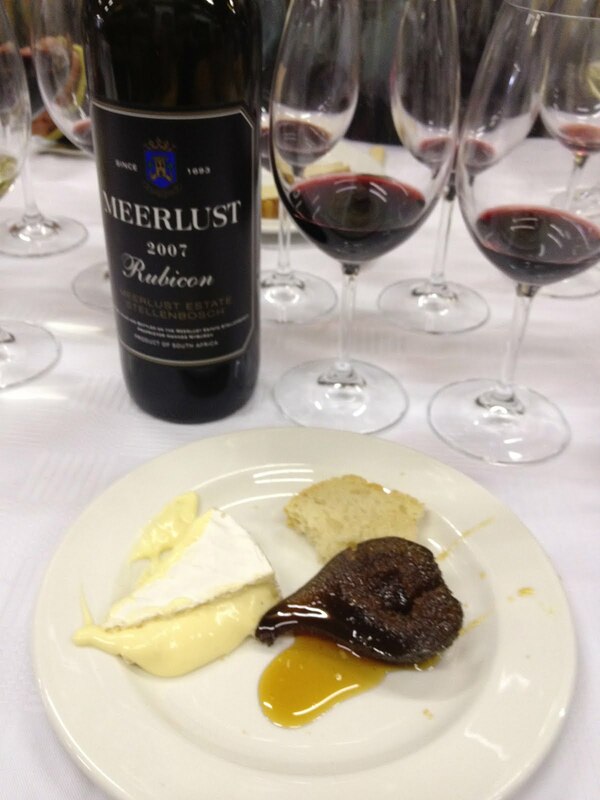 Meerlust currently has 35 families, many who have been with them for 8 centuries. Each family is provided a house on the property free of rent, as well as basic healthcare, and subsidized utilities and schooling. They have recently started a new trust company with two other wineries called Meerlust Logistics, which handles packaging and shipping for all wines. The workers are trained to manage and operate the company, and so far it is working very smoothly and is already profitable. Sept. 2012 - We left the Swartland wine region around 5:30 and drove back to Stellenbosch where we checked into the lovely Devon Valley Hotel. This is a long, elegant country inn perched on a hillside overlooking the vineyards. I was given a magnificent room decorated in purple and gold with a king size bed, fireplace, huge bathtub, and an expansive vineyard view. The downside was I only was able to enjoy the room for about 90 minutes while fully awake. It was still raining softly when we arrived, and as we were running late, I only had 30 minutes to rest in the room before being rushed back into the van to head to our evening venue (see below). Despite this, I managed to enjoy a cup of tea in front of the fire while gazing at the view, and then change cloths quickly for dinner. When I returned to my room around midnight, I immediately fell asleep, but set my alarm early enough to wake up, enjoy some coffee in front of the fire, then take a hot bath in the large and inviting tub. The breakfast buffet was delightful with over 30 different dishes in a large dining room with many windows and white tablecloths. Next time, I would linger at this resort and enjoy all the lovely amenities. 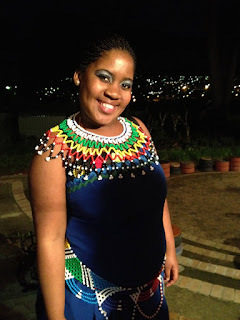 Another highlight of my trip to South Africa was the evening we spent at Amazink Live in a local Stellenbosch Township. This is a dinner show run by local entertainers as a way to support the community and create revenue for singers and dancers. It is one of many efforts in South Africa to promote entrepreneurship and independence for people living in the townships. Dinner was very casual in that you placed your order at a window and then collected a plate of barbequed beef with salad. It was quite tasty, and our group was fortunate in that the Stellenbosch wineries had donated over 50 different bottles of wine for us to taste along with the meal. But it was the music that took my breath away and brought most of the audience to tears one minute, and then dancing in the aisles in celebration the next. This was the deep throbbing soul of Africa with drums, dancing, and vocal harmony that shook me to the core. All the pain and sorrow of Apartheid echoed in the music, and then the hope and joy of the human spirit which refuses to be bound. The memory of this experience still brings tears to my eyes. Friday, Sept. 28 – The next morning the skies above Capetown were overcast and the day was cool. After the breakfast buffet, we boarded the van and drove almost one hour northwest to Swartland, which is known as a warmer viticulture climate and home to some very historic vineyards and “big reds”. 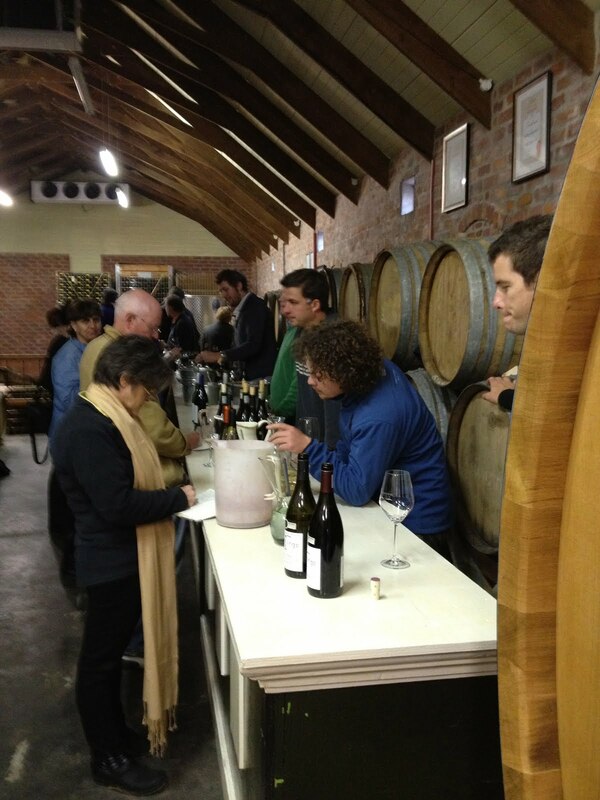 Swartland also has a reputation for spawning “renegade winemakers” with a bent towards natural, organic wines and innovative blends and styles. Our first stop was the Sadie Family Vineyards where winemaker Eben greeted us and provided a tour of his amazing old bushvine vineyards which produce only ¼ to ½ tons per acre. When we arrived Eben showed us the soil by picking up the wet clay and sandstone substance and letting it dribble through his fingers (see photo). Eben is a true “natural winemaker” in that he believes in almost complete non-interventionist winemaking. Not only does he preserve as many old South African historic vineyards as he can, but he promotes biodynamic farming practices (not certified), natural yeast, as little sulfur/SO2 as possible, and fermentation in concrete eggs, cement tanks, and recently, South African clay amphora. His wines are unique, and sometimes, magnificent. 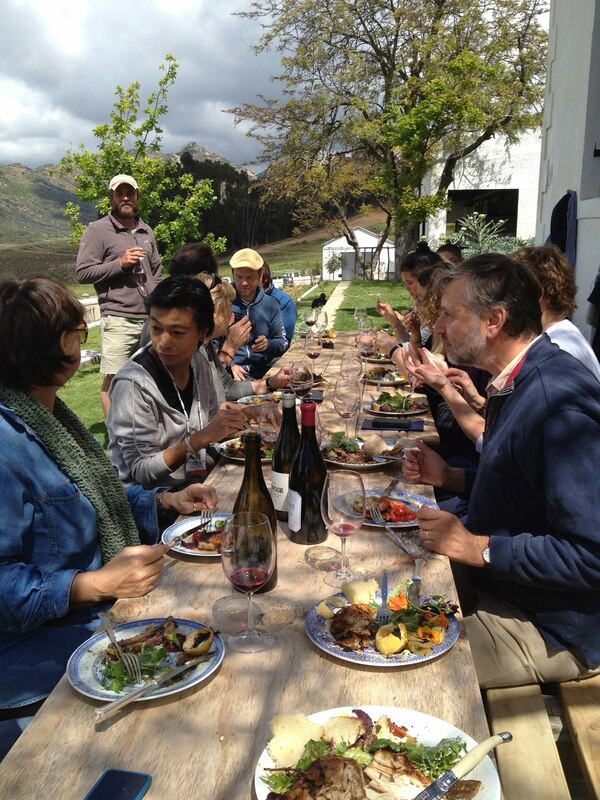 The next stop was a wonderful BBQ chicken lunch at Badenhorst Winery, which is located in an old farmhouse overlooking the vineyards, and hosted by Adi Badenhorst, his family, and other local winemakers. Here I felt like I was transported to Mendocino County wine country in California, as I was surrounded by “natural winemakers” with bushy beards, and an exuberance and passion for making wine “on the edge.” Our group was joined by the sommelier group, and we all enjoyed the magnificent buffet of food fresh from the garden and succulent BBQ. 1) Cut lemon in half. Scoop out pulp. Cut off bottom to create small flat cups. 2) Roast lemon cups in oven for 5 minutes on 450 to eliminate tart taste. 3) Stuff with cut up pieces of following vegetables: marinated artichoke heart pieces, black olives, red tomatoes – all sautéed briefly in olive oil, garlic, and salt. 4) Top with creamy goat cheese (alternative: cream cheese). After lunch, we drove on rough red dirt roads through wheat fields for around 20 minutes until we crested a hill to arrive at Porseleinberg Winery. This looked like a dilapidated farm with small outbuildings and many chickens running around. As soon as we arrived, a huge grey cloud approached and we were drenched in a spring rainstorm. We hosted umbrellas and ran into the small stucco building were winemaker, Callie Loew, offered us a tasting of his famous Porseleinberg Syrah – the only wine produced here. It is composed of pure fruit, very streamlined, with well-balanced acid, fruit and tannins, and a long finish. As we were tasting, a chicken ran into the building and got trapped against a large picture window. Callie bent down to pick up the chicken and cradle it in his arms as he continued to describe the wine. 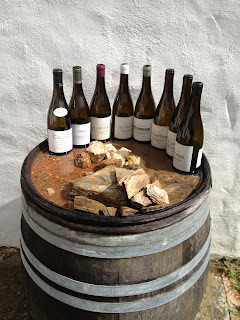 I felt that we were truly in the “renegade arena of the Swartland Wine Revolutionaries.” A very fun and memorable visit. We left Porseleinberg with only a few raindrops following and slowly made our way to Mullineux Winery in the small and charming town of Riebeek Kasteel. This is a picture perfect wine tourist town with an historic hotel and beautiful vineyard and mountain scenery. I would definitely return and stay here again in the future. The tasting of the Swartland producers, and especially Mullineux Family Wines, in the center of town, was excellent. Here I was especially impressed with the red wines, including complex mineral-laden syrahs and fruity malbecs. 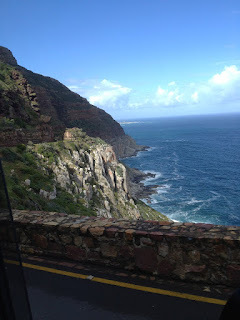 Sept. 27, 2012 - After walking through the beautiful vineyards at Cape Point, we discovered that the fuel pump of our transport van had gone out. Therefore we were delayed for almost an hour before back-up transport arrived so we could continue our trip to Steenberg Winery in Constantia. Fortunately Constantia, which is really a suberb of Capetown, was only a 20 minute drive from Cape Point Winery. As we drove the clouds descended and it started to rain. 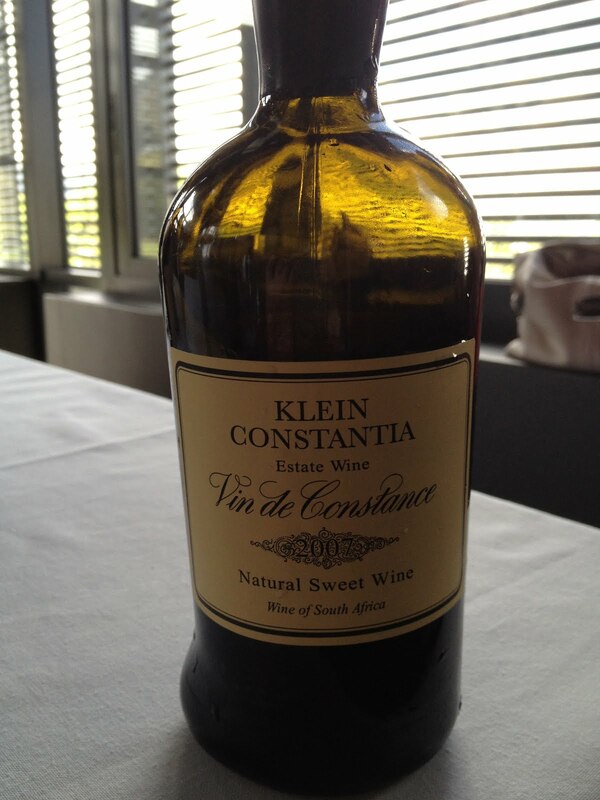 The tasting included six producers from Constantia, which is the oldest wine growing region in South Africa and boasts the legendary wine called Klein Constantia. This is a late harvest non-botrytis wine made from the Muscat de Frontignan grape and sells for $50 for a 500 liter hand-blown glass bottle made in Italy (see photo). We had the 2007 and it was delicious with sweet apricot fruit on nose and palate, a cleansing acidity, and long finish. 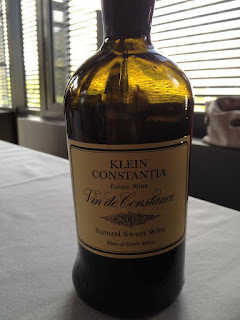 The tasting included around 20 wines from Constantia, and in this region I was very impressed with the chardonnays, Chenin blancs and of course, the famous Klein Constantia. Lunch was a grand affair at the public Restaurant at Steenberg Estate where we had a three course lunch that didn’t end until close to five o’clock. The food, wine, service, and view were excellent, and I would definitely return here again on a future trip. It started with a fried South African Soft-Shelled Crab with the Steenberg Brut of Pinot Noir. 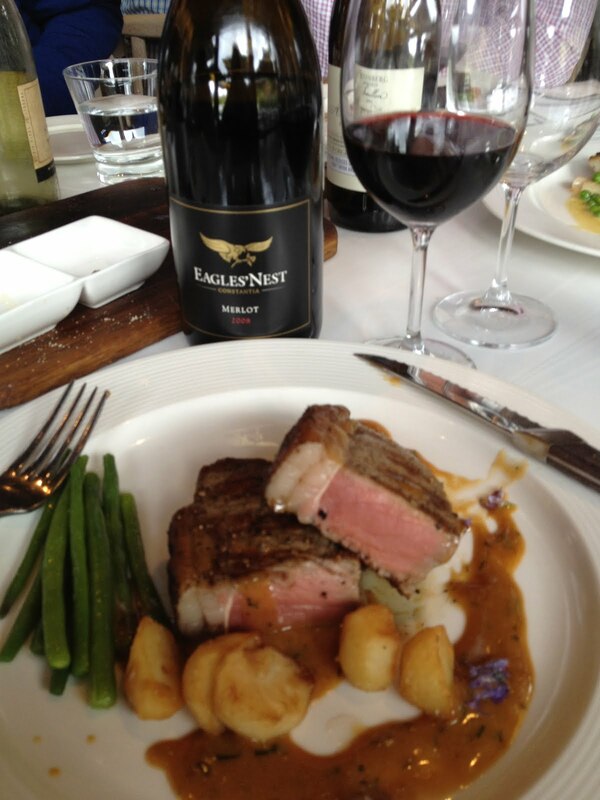 The main course was beef filet with 2008 Eagle’s Crest Merlot. Dessert was a mixed assortment of chocolates and petit fours artistically presented on a long board. We left Constantia in the pouring rain and returned to our hotel for a short rest. At 6:15 we boarded the bus again and headed to a wine bar called French Toast where they had reserved the second floor for a tasting of South Africa’s top 5 star wines for the past 3 decades. It was a fascinating tasting consisting of 24 wines from the 1970’s, 80s, 90’s and 2000s, of which 7 were white and the remaining 14 were red. It was impossible to select a favorite as they all were exceptional.